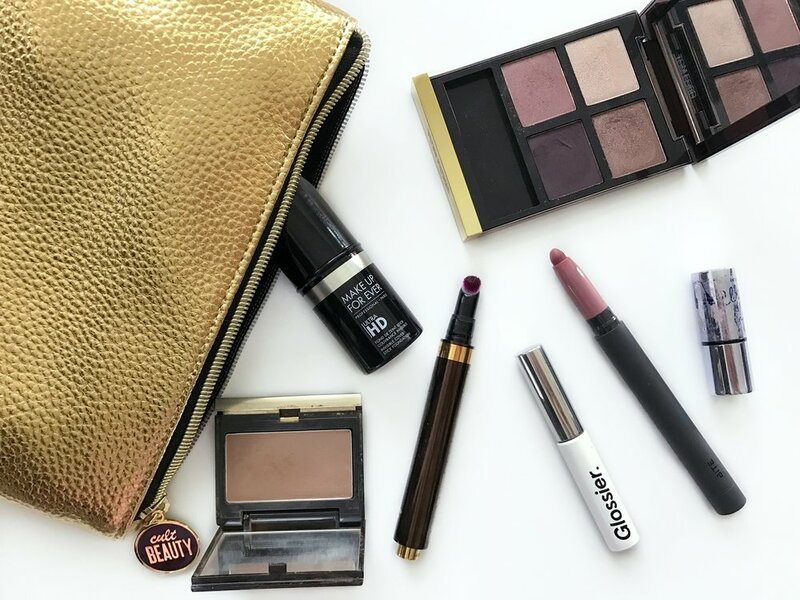 Last month, I put together a makeup bag of products I wanted to focus on using (here). I found it super convenient to be able to grab a bag and have a whole look, so I decided to continue the process for 2017. I know we're like 3 weeks into January already, but I thought it would still be fun to share what I've been carrying around. This month's look has been simple, and actually I don't think I've worn any makeup aside from a bit of foundation here and there. I guess I should work on that, huh? At any rate, I've been liking the Make Up For Ever Ultra HD Foundation Stick, which has been super convenient to use on the go. I still think I prefer the overall finish of the Hourglass Vanish Foundation Stick*, but this one has been almost as good. For eyes, I grabbed Glossier Boy Brow, which is a fantastic brow product. I also love the simple color selection of Tom Ford's Orchid Haze eyeshadow quad. For face, I grabbed my two must have products: Benefit Watt's Up and Kevyn Aucoin The Sculpting Powder. So much love for those two! Last but not least, I picked two lip products to cover basically any occasion. I'm still obsessing over the Bite Beauty Matte Creme Lip Crayon* in Glace, and I grabbed Tom Ford's Patent Finish Lip Color in Orchid Fatale. Yup, all the heart emojis for these! Do you have a makeup bag of products you reach for daily? Have you tried any of these products? I'd love to know!